Students interested in attending the coaching classes can submit the Application Form to office of coordinators. Coaching is provided in General Knowledge, Information and Communication Technology (ICT), Reasoning (Including Mathematical), Current Affairs, Data interpretation, Research Aptitude, People and environment, Higher Education System: Governance, Polity And Administration for UGC NET paper- I examinations. For CSIR Net examination coaching is provided in Life Sciences, Environmental Sciences, Chemical sciences and other subjects. Subject specific classes are conducted on the basis of the demand raised by the students. These classes are also in the form of remedial classes. The faculty members also put efforts to provide guidance for the slow learners. A team of committed teachers and specialists of proven merit provide a professional edge to the Cell. Over the years, the CEC has catered to the need of students with fair degree of success. This has greatly helped to improve the performance of all the students in various examinations. CEC, in the long run, will start coaching for civil services examinations. Students of Central University of Punjab. Dr. Kiran Kumari Singh, Assistant Professor, Centre for Geography and Geology. Dr. Puneet Pathak, Assistant Professor, Centre for Law. 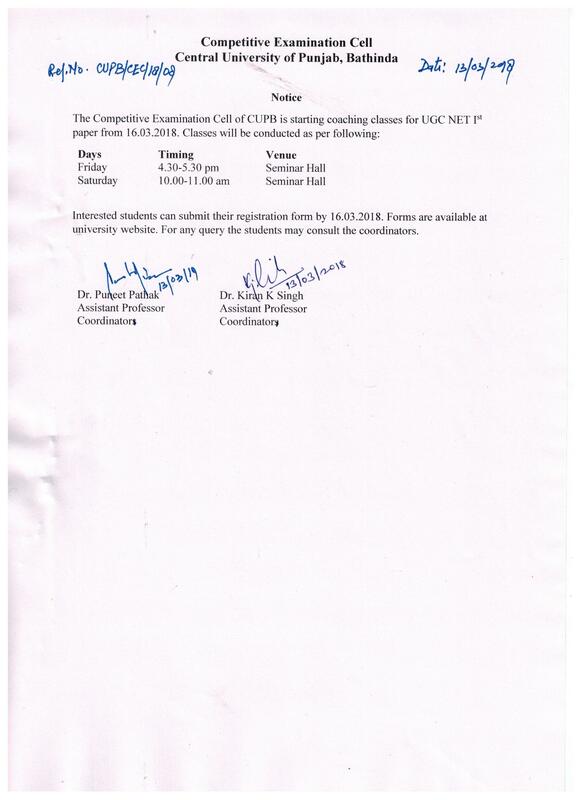 Coaching classes for UGC/CSIR NET have been started, in initial phase, keeping in view the need of students. Their requirements were identified by conducting a formal survey which highlighted the areas of difficulty of the students. In whichever subject demand was raised by the students coaching classes were arranged for them. A total of four batches have been taught. The first batch was started on November 7, 2012 which ended on December 17, 2012. A survey was conducted on 16.10.15 and 18.10.2012 to identify difficulty areas of the students. Classes for UGC and CSIR- NET were started for first paper and four subject specific papers namely Life Science, Environmental Science, Chemical Science and Geography. A total of 102 students were registered for the coaching. At the end of the course a mock test was conducted on December 26, 2012. In year 2013 again this course was started with a formal survey. 57 students were registered and classes went on from February 11 to 17, 2013. Coaching classes were started for first paper of UGC and for four subject specific papers (Life Science, Chemical Science, Economics and Political Science). The mock test was conducted on June 4 and 5, 2013. Students’ interest in such classes reflected again in the survey conducted on May 26 and 29, 2014 and another session of coaching classes was started on June 2, 2014 which ended on June 20, 2014. Ninety two students had shown their interest in running the classes. No formal registration was done for this batch. The fourth batch coaching was organised from 08.12.2015 to 23.12.2015. All the classes were run with the support of faculty members and administration. The coaching classes yielded very good result any many students who had attended the classes qualified CSIR/UGC-NET, GATE and GPAT examinations. CEC laid special emphasis on SC/ST/OBC and women candidates in order to motivate them to qualify NET examinations. These coaching classes also functioned as remedial classes for the students as the problematic areas of each and individual candidates were given emphasis and priority. Last modified: April 06 2018 13:20:42.